This year's show felt very different from last year's. Instead of just having a single night for a few hours, this year, the York-Sheridan Design program held a travelling showcase across 4 different venues on consecutive days. I only managed to find time to visit on their last day. I've been hyped up about this ever since I saw their promotional video on Facebook, but it's unfortunate I can't link that video here. The designer behind all the motion graphics for this year's branding is none other than Luc Palombo, an alumni from both my high school and art program. Small world. For their final day, the Konrad Group hosted them at their Quantum Coffee/BrainsStation location. Quantum Coffee has one of the most distinctive interiors in Toronto and it's located on the northwest corner of King and Spadina. I arrived during a post-lunch lull in traffic. Do you even see those ceiling lights? Straight out of Deus Ex I'm telling you. This spring suspension reminded me of earthquake resistant dampers. If last year's grad show could be described as "grand", this year YSDN is giving off a more "inviting" vibe. This of course also comes down to the location being more accessible to pedestrians, but even the display style lends itself to more a more open and casual experience. Kiosks were around for visitors to explore work in greater depth, but also as a way to display digital content such as videos, as there were no tablets set up in any display. Little variations of the branding could be found all over the place. They really outdid themselves with such a dynamic logo. I was lucky enough to have a chat with one of the two designers who worked on the overall branding - Camilla Dinardo. You can check out her site for more excellent graphic design work. In the end I didn't get a chance to talk to Simone Robert, the other designer responsible for such a stellar branding job. I picked up one of these books in a heartbeat. For a book of this quality only for $25 it was a steal. There's a compilation of all the grad work within each book, which makes it so much easier to revisit a piece you particularly liked later on. These bookmark info cards slotted into the front page of every book was a nice touch. 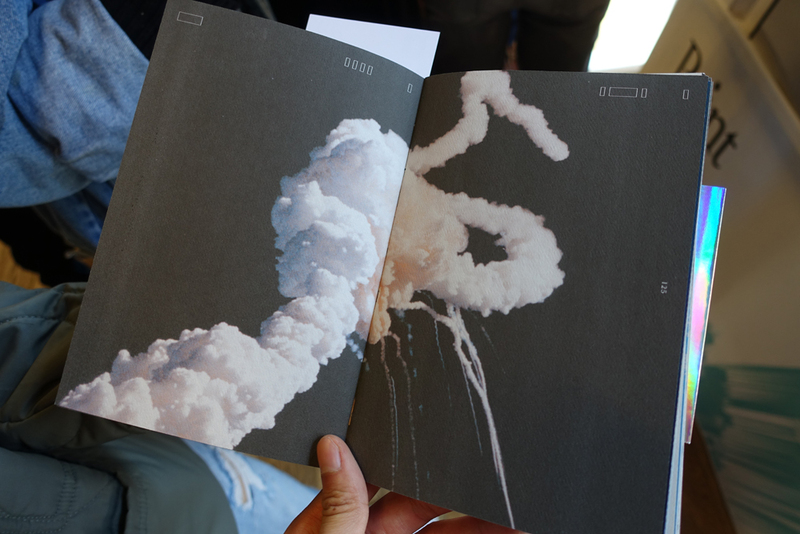 This magazine was made by Angela Li, and had some truly amazing spreads inside. You can see more of it here. One of the most entertaining parts of the show was the ability to make your own posters at this kiosk. Using a variety of sliders and options, you can create amazing extrusions of YSDN artwork and choose between awesome colour combinations. At the very end, you can email your own creation back to yourself. The keyboard was a little tricky to call up though. There was perfect summer weather outside that day so I had to grab something cold on my way out. Luckily for me, my coffee was on Quantum because I had just filled up my stamp card. They have one of the best looking stamp cards ever.